In a great result for the Demons District, Melanie Robinson brought home the Most Outstanding Multicultural Program Award for 2017. Melanie, who is Head of Sport at the school, helped create the inaugural Naitanui In School Academy to over 150 students in collaboration with West Coast Eagles and WAFC Staff. St Norbert College situated in Queens Park has one of the highest number of students with a non-English speaking background at 39%. The School continues to work closely at creating links to local community club Queens Park, to give more students the opportunity of playing football. The Academy ran for 6 weeks in term 2 with the entire Year 7 cohort. Students were exposed to training from WAFC Development Staff, AFLW and AFL players with all students receiving a wristband and drink bottle as recognition of participating in the program. The School already features heavily in the West Coast Eagles Next Gen Academy with over 10 students registered with the club. Including young stars such as Nyika John & Noel Mancuveni who are in the Naitanui Elite Program and WAFL Colts/16s at Perth FC. These achievements wouldn’t be possible without the strong support and enthusiasm from Melanie and her PE staff. 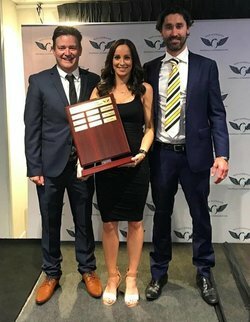 Manger of Game Development at the West Coast Eagles & former 2006 Premiership Player Adam Selwood said " Congratulations to Melanie and her team on the inaugural Naitanui In School Academy. Her contribution has been outstanding and it is great to see ambassadors being recognised appropriately for their efforts. We look forward to growing the program off such a strong foundation in future years"
WAFC Football Development Officer Chris Brown agrees "Melanie has done a fantastic job assisting WAFC and WCE staff in creating the inaugural Naitanui In School Academy. To have over 150 students from the Year 7 age group, the majority of which are born overseas and don’t play footy engaged in the program was outstanding. Without the dedication and hard work of School Teachers like Mel and her team, we wouldn’t be able to expose our game to new markets. We are extremely proud of her efforts and very excited to grow the program further in 2018"
The AFL Schools Ambassador Program encourages schools and communities to work together to develop and promote Australian Football in the classroom and on the sporting field. 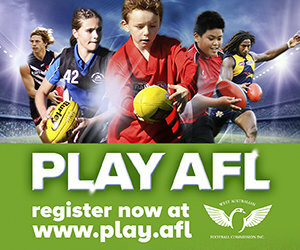 All registered teachers are eligible to become a AFL School Ambassador. The WAFC provides training, equipment and support, free of charge.